“All men and women of Nagorno-Karabakh Republic are part of the army, but we can not say how many soldiers are now operative over the frontline” explains an official from the Ministry of Foreign Affairs in Stepanakert. Soldiers are engaged in defending their positions over the frontline, although in May 1994 an official ceasefire was also signed by Armenia. The ceasefire is regularly broken with casualties on both sides. The conflict started in 1988 and escalated into full-scale war when the Soviet Union collapsed in 1991. Armenians went to war with Azerbaijan, with backing from Armenia. The conflict left 65,000 ethnic Armenians and 40,000 ethnic Azeris displaced. Clashes between the Azerbaijani and ethnic Armenian forces over the breakaway enclave of Nagorno-Karabakh last year were the worst violence the region has seen since the ethnic war over the territory ended in 1994. Azerbaijan boasted of “destroying” 170 opposing troops, while sources from the Armenian Karabakhi forces estimated they had killed 300 Azeri soldiers. In the village of Talish, Azeri forces entered the houses killing four old-men and they brutally cut off their ears. Traces of those raids are still visible walking through bombed-out houses, shops and a destroyed school. Locals were transferred to near villages, where they found relatives. The border territory is now full of military camps and bases. In the capital Stepanakert a military academy substituted the traditional high-school. Between the ages of 13-18 the young Artsakh citizens are forced to become soldiers, they wear uniforms and train in a military academy. Their everyday life is stuck in a military limbo, caused by a war that’s seen as normal and necessary. Disassembling and reassembling a Kalashnikov rifle is a skill that is taught in schools from age 13. On the front line, young soldiers take care of their enemy’s actions. In the military academy, they learn maths, history and English, after physical exercises and marches. 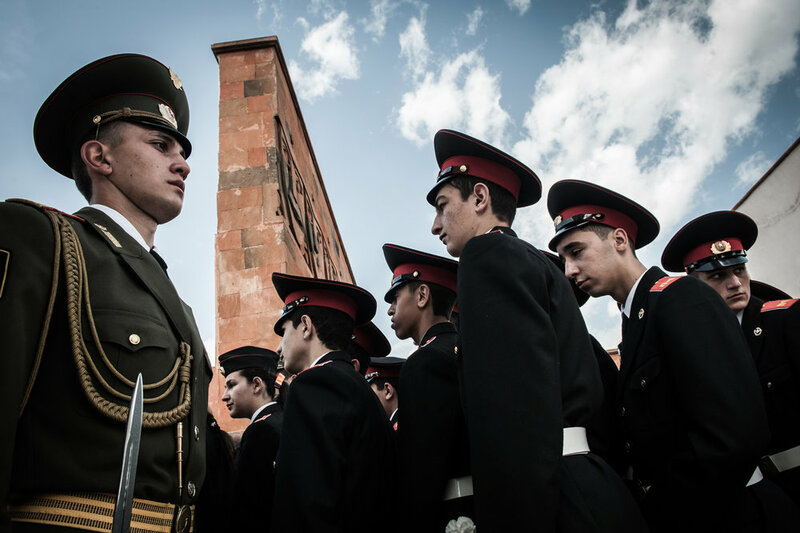 Young men in Karabakh are required to serve two years of military service. In 2015 in Nagorno-Karabakh, women were accepted and joined the military high school in Stepanakert for the first time. From schools to sports fields, from military academies to art institutions, the youth of Karabakh dream of a different future, aware that their generation will build the foundation for international recognition. The younger generation, having grown up amid relative stability awoke to the fear of losing loved ones, homes and lifestyle. The clashes strengthened solidarity within Nagorno-Karabakh society and reinforced calls to end the conflict by any means necessary, including war and advancing deeper into Azerbaijan’s territory. More than 60 per cent of Nagorno-Karabakh respondents expressed “disillusionment with the future of the country”, and more than 70 per cent voiced readiness to emigrate. During the escalation, the de facto authorities called up the vast majority of Nagorno-Karabakh’s male population, most of whom remained in the trenches for at least the next two months.